A synergistic blend of herbs to help support the colon. The large intestine (Colon) is an important part of our body. It's role is vital to proper digestion & moving waste out in a timely manner. Often the colon can get clogged with accumulated matter. When this happens you may experience any number of bowel issues. Getting enough dietary fiber is the best way to make sure your digestive system works optimally but if food and waste are not able to move quickly through the intestines then it may be time to help encourage the body's natural detoxification process. 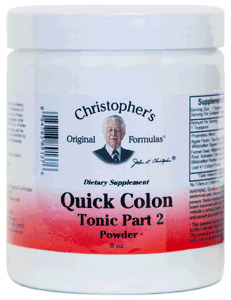 Dr. Christopher's Quick Colon #2 Powder was designed to follow the Quick Colon #1 Capsules & aids in the detoxification of the lower bowel.